Attipas baby shoes are growing more and more popular across the globe, and were even included in the Oscars gift bags at the 89th Academy Awards in February 2017. The South Korean brand of functional baby shoes caught the eye of this year's Oscars Gifting Suite organisers, thanks to the clever Attipas design and striking patterns. 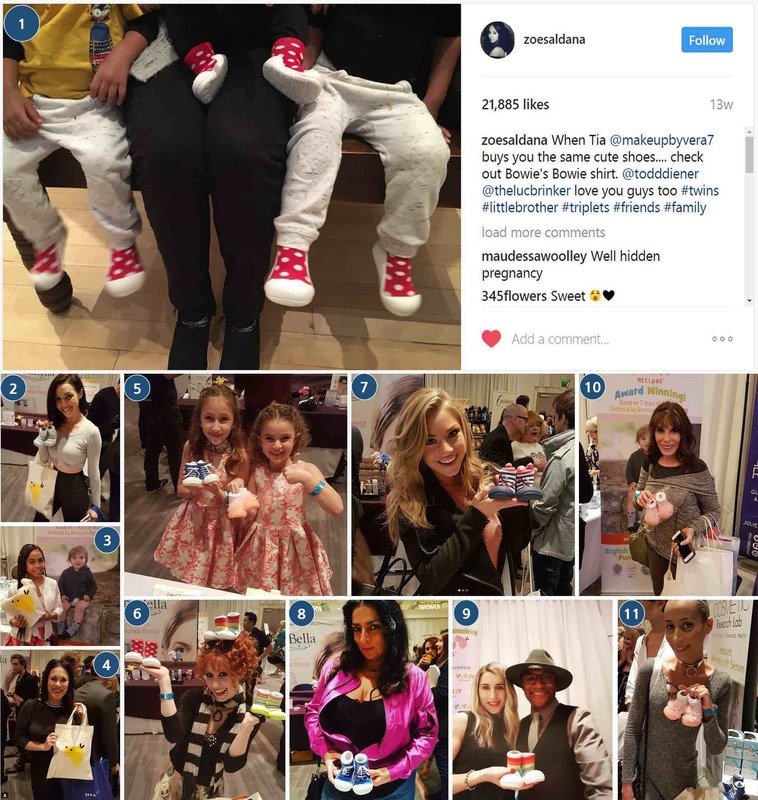 Every celebrity nominee who entered the gifting lounge in the days leading up to the Oscars ceremony got a chance to add some Attipas kids' shoes to their bag of gifts. We are delighted that the comfortable, healthy baby footwear championed by Attipas became part of this year's luxurious Academy Awards and we look forward to seeing Attipas shoes out and about on the feet of celebrity kids as they enjoy their new favourite footwear! Now you too can get hold of Attipas baby shoes in the UK, with a large range of designs to choose from. Don’t forget we offer speedy delivery all around the country, so you are guaranteed to receive your preferred pair of shoes in time for that family holiday, event or to gift to someone you love. 1. Zoe Saldana. The renowned Hollywood actress joined us to pick some cute red baby shoes from the Polka Dot collection for her three little boys. The star played Uhura in Star Trek, Cataleya in Colombiana and officially joined the actors’ A-list with her outstanding role as Neytiri, the Na'vi princess, in James Cameron's Avatar in 2009. 2. Scheana Marie. Beautiful actress and model Scheana from Vanderpump Rules holds a pair of Attipas baby shoes from the “Natural Herb” collection in blue. 3. Asia Monet Ray. The young Californian dancer who has taken the dance world by storm visited us at the Oscars gifting suite at the SLS Hotel Beverly Hills. 4. Romi Dias. The gorgeous actress from 2017 TV series Doubt, who has also been in Castle and Criminal Minds, joined other celebrities at the Oscars gifting suite. 5. Ava Kolker & Lexy Kolker. A big thank you to Ava and Lexy Kolker, two sisters as talented as they are cute, for visiting our Attipas stand at the SLS Hotel! 6. Bonnie Morgan. We loved meeting the actress and extraordinary contortionist Bonnie Morgan, who plays Samara in the Ring movies. We really enjoyed chatting and hope that you like your Attipas baby shoes! 7. Nikki Leigh. Stunning model and Hollywood actress Nikki Leigh with a pair of adorable Attipas baby shoes in Marine Red. 8. Alice Amter. It was amazing catching up with Alice Amter from CBS' The Big Bang Theory at this year's Oscars! Here she holds Attipas baby shoes in our blue "Sneaker" design. 9. Tommy Davidson. Selfies with talented actor and comedian Tommy Davidson. We were thrilled to meet you and hope you’ll love Attipas baby shoes as much as we do! 10. Kate Linde. Meeting the star of The Young and the Restless - the lovely Kate Linde! Attipas’ style “Corsage Pink” pictured. 11. Isis King. It was such a pleasure to meet Isis King, one of the finalists from America's Next Top Model. Great to see she gave Attipas shoes the fashionista tick of approval - can’t wait for adult sizes to be launched!